The Ask: Partner with ASI founder to create a brand identity and style guide. Translate that brand into a website that introduces the business and generates leads. Antimicrobial is becoming more relevant in the medical industry and awareness around antibiotic overuse is now a topic of mainstream discussion. Recognizing this demand and his expertise as an infectious disease pharmacist, Josh Caraccio saw an opportunity to start a business to help healthcare providers of all sizes have access to antimicrobial experts. 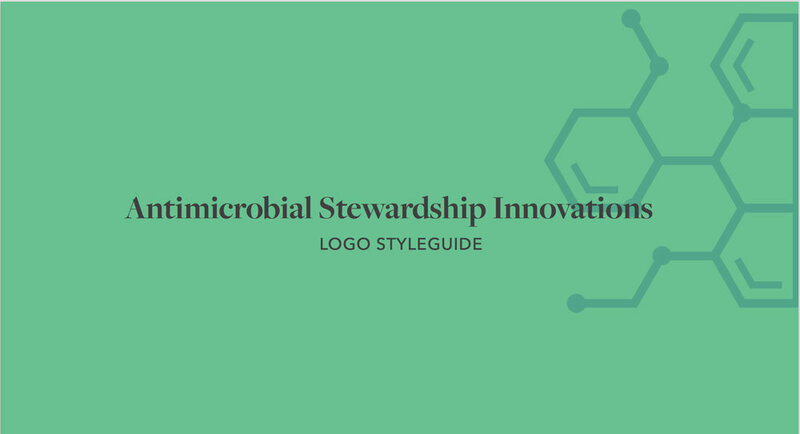 Antimicrobial Stewardship Innovators (ASI) needed a brand identity to help their grassroots efforts to gain awareness. Starting with surveys and moodboard exercises, the ASI team helped me to narrow in on their preferences. Through a few rounds of revision we arrived at a logo that communicated science and approachability. This logo was expanded upon in a brand style guide. This helped to inform subsequent brand collateral such as presentation templates and business cards. The next step was to translate the professional identity into a website that provided information to potential clients from different roles within the healthcare industry. By creating a website structure and assigning groupings to the array of service offerings, website visitors could explore different paths for their needs. 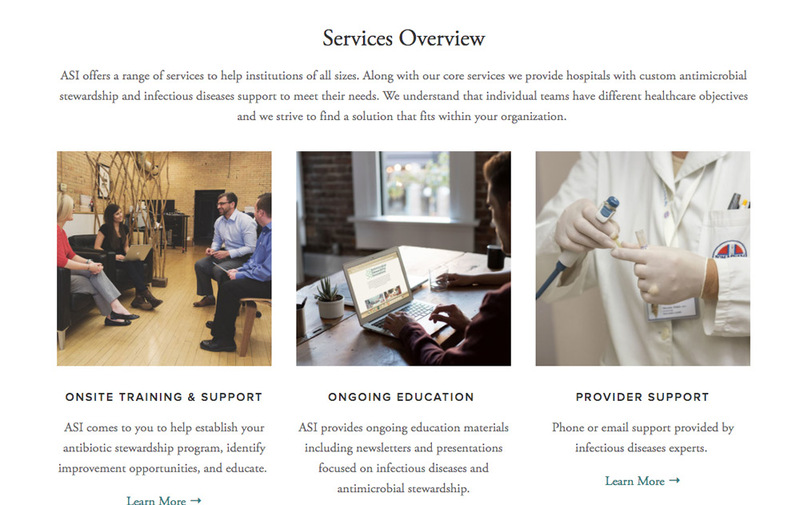 Since ASI is a start-up still in the process of refining its services, they needed access to view website analytics and adapt the pages based on their learnings. The structure provided flexibility to evolve with the business and I worked with Josh to ensure he had the skill set to make changes as necessary. It was important that Josh and his co-founder show their human side on the website and have images to work with in the future. I art directed a photoshoot to provide them with a custom image solution at a cost comparable to purchasing stock photos. These images were also available for use in emails and blog posts to help drive awareness through content campaigns that I consulted with Josh about following the launch of the website. 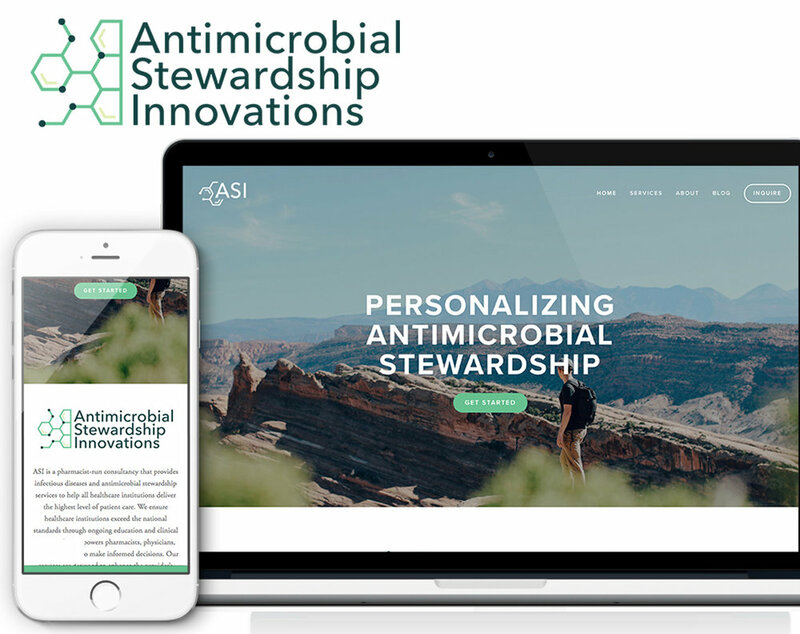 ASI continues to be an exciting client to consult for as they gain traction in the relevant antimicrobial space.